In upper New York, a man had his own idea for a theme park he called Storytown USA. This simple beginning began with a park themed to Mother Goose and other children's stories. From there, the ideas expanded, which eventually blossomed into a very unique amusement park. Now owned by Six Flags, it's a top park in the state. Charles Wood originally opened Storytown USA in Queensbury, NY in 1954. With different themed areas through the years, he officially changed the named to The Great Escape Fun Park in 1983. With the 90's came a big change to the park. 1995 brought a new water park called Splashwater Kingdom. With attractions for the whole family to enjoy, Splashwater Kingdom becomes a major hit with the public. Premier Parks (now Six Flags) acquired the park in 1996 and brought the Looney Toons characters to upper New York. With six roller coasters, it has something for everyone. 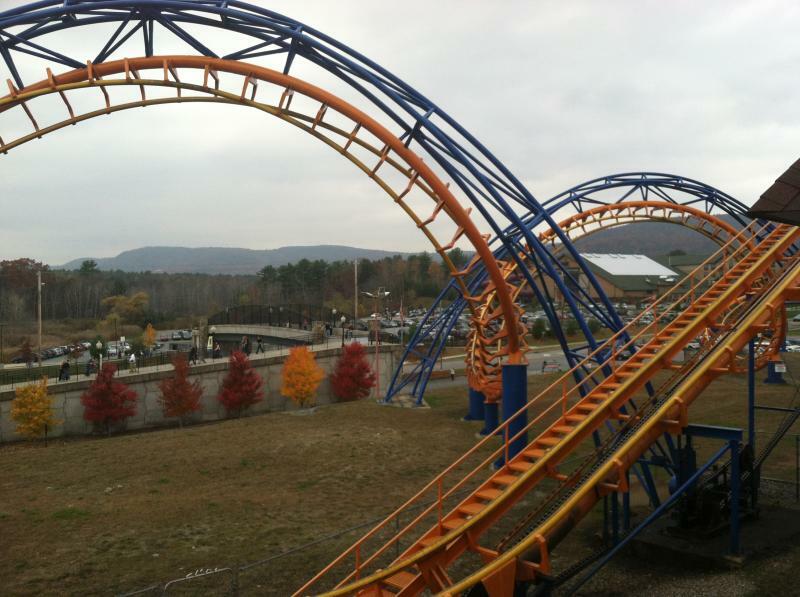 For the thrill seekers, The Comet and Boomerang Coast-to-Coaster will bring smiles to all. The Alpine Bobsled and Steaming' Demon are coasters the whole family can enjoy. The little tikes aren't left out as they can enjoy Canyon Blaster, and Frankie's Mine Train. The Comet is an amazing coaster with a history almost as great as the park itself. It originally opened in 1926 as the Crystal Beach Cyclone, at Crystal Beach amusement park in Ontario,Canada. It was then known one of Harry G. Traver's "terrifying triplets." These three coasters not only broke the rules, but threw them out the window. With sprawling drops, crazy figure eights and high speeds, and accompanied by a nurse at the ride station you knew that you would be in for the ride of your life. That was until 1946 when the cost of running the ride became too much. The ride was then dismantled, but it was definitely not the end. With some of the original wood and metal, John Allen and Herbert Schmeck from PTC designed an out and back coaster, and called it the Comet. The coaster ran until the park closed in 1989. Charles Wood then purchased the coaster, and kept it in storage at his other park Fantasy Island. On June 25, 1994 The Comet came back to life for a third time and has been thrilling guests ever since. It may not be as crazy as it once was, but it's still a ride you can't miss. Now just called The Great Escape and Splashwater Kingdom, the park has grown up a lot. From its simple beginnings of children stories, to thrill rides and roller coasters there's so much to enjoy. With all that, the park feels like nothing has changed. At The Great Escape, we can all feel like we are kids once again.